Shamrocks and Shenanigans, will be a fun run/walk to remember! It has something for everyone! For the wee folk, we have added a kids and candy division for those 12 and under. It is only $10.00 and the participants receive a mug of candy. For anyone who registers by 6:00pm on March 5th, we will have a festive technical, long sleeve shirt and a beer glass to hand out with your paid registration, along with 2 free beer tickets for those over the age of 19, who cross the finish line. If you register after 6:00pm on March 5th, and you are over the age of 19, you will only receive 2 free beer tickets, upon crossing the finish line, and of course a free meal! Photo ID will be required to verify your age to receive the beer tickets. Prior to the race, we will have coffee, tea, and other snacks available. Post race, we will be serving Irish stew and biscuits to all participants. For those not of legal drinking age, and those not wanting a beer, we will have coffee, tea, Root Beer, and other non-alcoholic beverage choices available. This will be a chip timed event with separate walking and running divisions. No post race prizes, however completion of the race will give you bragging rights of being Irish for a day, and a cold beer or two. 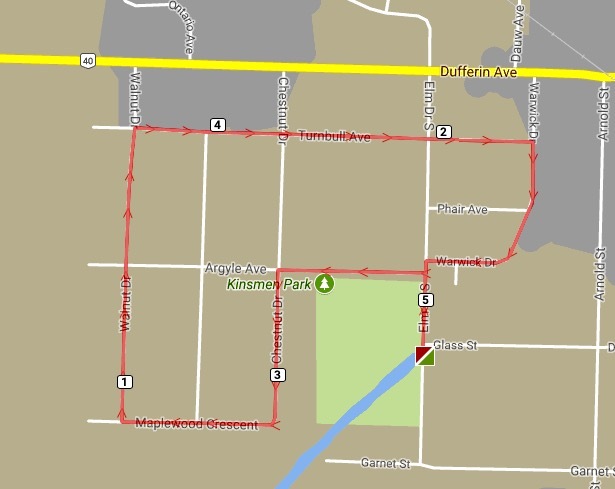 Parking is available on site and the course will be a double loop through the "VLA" neighbourhood in Wallaceburg, which is near the hall. Route map below. All proceeds from this event support our Youth Program which is in local schools. Start at UAW Hall at 88 Elm. Head north onto Elm and turn left onto Argyle. Turn left onto Chestnut, and follow to end where it turns into Maplewood. Turn right onto Walnut. Turn right onto Turnbull and follow to end at Warwick. Follow Warwick until it ends at Elm. Turn left onto Elm and immediately right onto Argyle, and follow same route again. Once back at Warwick and Elm second time, turn left onto Elm and continue back to finish line at UAW Hall. For the wee folks. Each participant receive a mug of candy . FROM CHATHAM: Follow Highway 40 (St. Clair Road) into Wallaceburg. At the fork, on Murray Street, turn to the left, which becomes McNaughton Avenue. Continue on McNaughton, over the bridge and turn left at the lights, onto Dufferin Avenue. Proceed on Dufferin Avenue, and at the forth stop light (Elm Drive), turn left on Elm. The UAW Hall is located about 3/4 of the way down Elm on the left. Address is 88 Elm Drive. FROM DRESDEN: Follow Highway 78 (McCreary Line) to Wallaceburg. It will turn into Margaret Avenue coming into Wallaceburg, going past the hospital. Continue on Margaret straight through the lights and over the Dundas bridge where Margaret turns into Wellington Street. Continue on Wellington to the CIBC bank, at the stop lights. Turn right at the corner of the bank onto Dufferin Avenue. Proceed on Dufferin Avenue, and at the forth stop light (Elm Drive), turn left on Elm. The UAW Hall is located about 3/4 of the way down Elm on the left. Address is 88 Elm Drive. FROM SARNIA, SOMBRA, PORT LAMBTON: Follow Highway 40 into Wallaceburg. At the end of Highay 40, turn left onto Dufferin Avenue. At the first stop lights, at Elm Drive, turn right onto Elm. The UAW Hall is located about 3/4 of the way down Elm on the left. Address is 88 Elm Drive. March 17 11:00 AM EDT - Races Begin!